ok, let’s be honest: sometimes us dogs don’t eat as well as we should. and by that i mean, sometimes i like to eat dirt or snack on a bug or two while hanging out at the park. and dirt or bugs aren’t super healthy, right? even though the human feeds me some of the best food money can buy (in between my dirt-and-bug snacks), she thought it would be a good idea to start giving me vet-approved pet nutritional supplements. but which one would we choose? 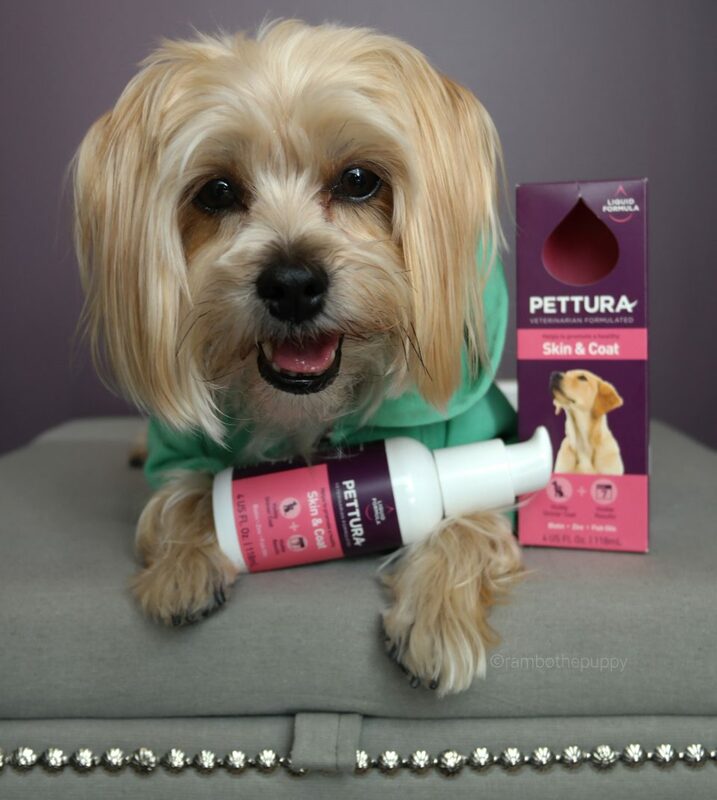 that’s when the peeps at Pettura contacted us to see if i’d be willing to try out their new line of veterinarian-formulated supplements in exchange for an honest and unbiased review. of course i said yes! what pup would say no to free stuff that’s good for you? not me, no way. 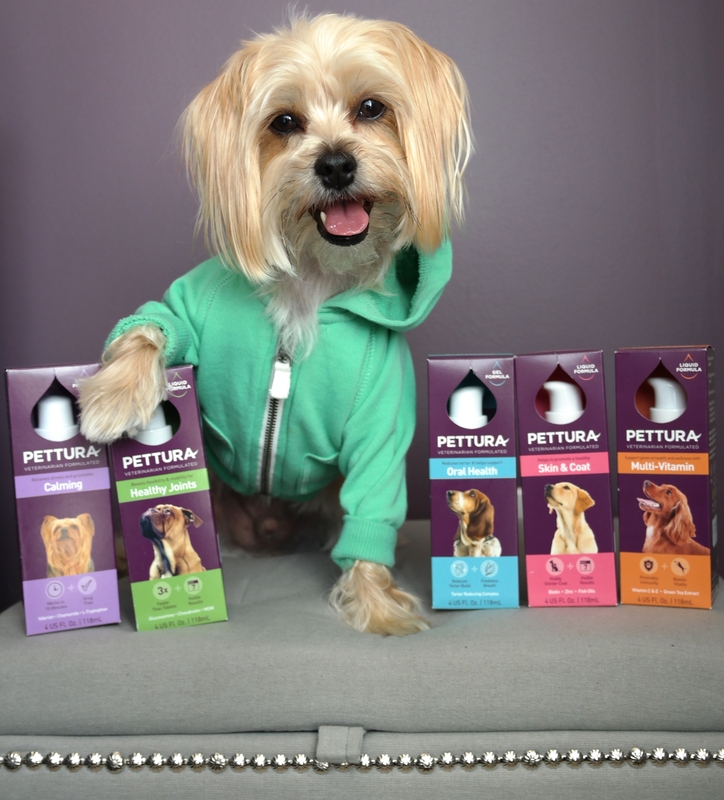 my Pettura supplements came a few weeks later in the mail, and i was so excited to try them out! multi-vitamin, which is made for pets and pet parents who want to keep their pooch as healthy as can be each and every day, for years to come! each of the Pettura supplements comes in liquid form, which means NO shoving pills down my wittle throat (which is just as tragic and sad as it sounds, trust me). each one comes in a pump; all you have to do is add a squirt or two (depending on your dog’s weight and size) to their food or a treat, and they’ll gobble it right up. because, oh did i mention? this stuff tastes mother puppin’ delicious, too! after a week of testing them out, my favorite flavor was the skin and coat, but the mutli-vitamin came in at a close second! in just a week, my coat was shinier and i was scratching a lot less (be gone, dry winter skin!). whoohoo! i wasn’t super fond of the calming flavor – the human had to give me a LOT of chicken treats with it so i would actually take all of it – but it did calm me down a bit when the lawn maintenance guys came by with their big blowers and lawn mowers (aka “monster machines” at least in my opinion). so that’s a plus, even if it wasn’t my absolute fav. i was so excited to test out all the supplements Pettura sent me that i decided to go all in and try them all at once! which, i found out, wasn’t a super great idea. i have a really sensitive tummy to begin with, and all the supplements together gave me the poops :-/ after that, i stuck with my two favorites – the skin and coat and multi-vitamin – for the rest of the week. if you decide to get the whole line, i suggest you start your pup out on one formula for a few days, then add a new one into the mix each week or every couple of days. so, what’s my human’s favorite thing about Pettura? one of my human’s favorite things about these supplements is that they’re made out of the highest quality ingredients, which have all been developed by super smart veterinarians and are totally safe for pups. she also loves that the liquid formula is absorbs three times faster than gross tablets and it’s twice as effective (wow! ), which is why we noticed the supplements working after using them for just a week! want to give Pettura a try? you can find the line in CVS stores nationwide and select Kinney Drugs in NYC! not sure if you’re ready to take the plunge? want learn a bit more about them first? 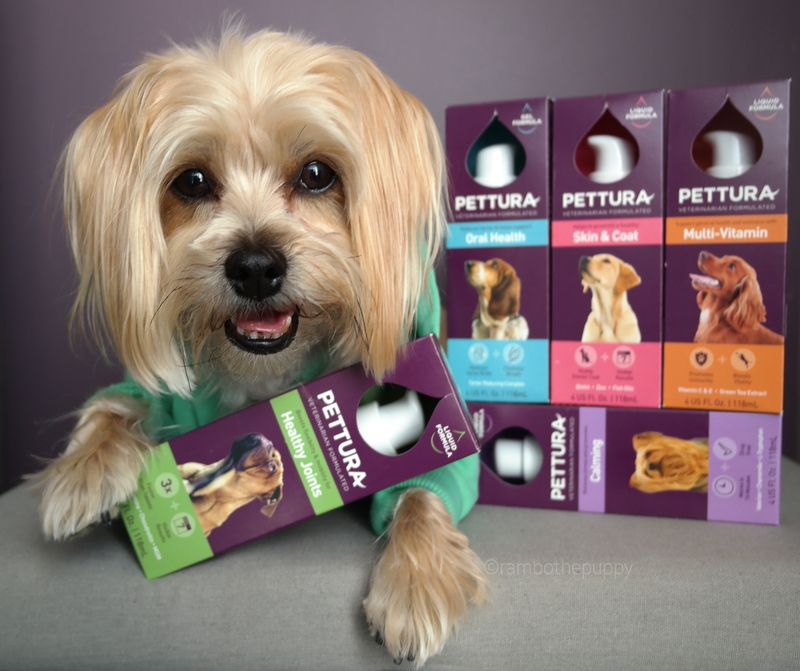 then head on over to facebook and “like” the Pettura page, follow @pettura_range on instagram, or check out the Pettura website to find out more about these awesome new pet nutritional supplements!